Welcome to 2014. In some ways, the transition from one year to another is fairly meaningless. You flip a page on a calendar and move on. You are the same person you were before. Yes, there is this cultural habit of establishing new goals or “resolutions” for the year ahead; but the only change you are obligated to make is to train your brain to remember it’s a new year when you write down the date. But transitioning from one year into another does seem more meaningful than this. It is a time when we really feel the passage of time. We can’t help but reflect back on the year behind us. And we often take this opportunity to think about our goals for the year ahead. The biggest mistake that people make in thinking about the year ahead is giving too much power to the new year. We become lured by the hope and promise of turning a new page and we imagine big goals. We will turn over a new leaf; we will exercise every day; we will start eating well; we will go to bed at a reasonable hour. We will be different than we have been. But once the glitter of the new year begins to fade, and we bounce back from our champagne induced hangover, we realize that change is hard. We are still weakened by the same temptations from before. The new year is just as constrained by limited hours in the day. And all of our bad habits from last year have chased us into this one. One solution is to keep your New Years resolutions in check. Forego some of the “big hairy audacious goals” and focus on small changes you can make that will have a big impact over the long term. 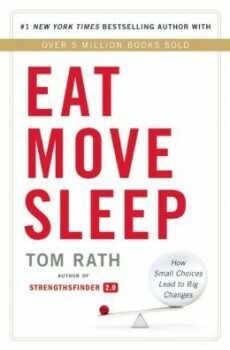 According to Tom Rath, a senior scientist at Gallup (and a fellow MAPPster,) “small choices change everything.” In his new book, Eat Move Sleep, he proposes small daily decisions that are easy to make but can accumulate over time for powerful effects on your health. Just as an example, some of the techniques to eat better include making healthy foods more visible and prominent in your fridge or on your counters. Don’t tuck the vegetables away into the bottom drawer where they are quickly forgotten. When eating out at a restaurant, be the first one to order so you are not swayed by the unhealthy choices of your dining companions (research shows the choices of the first person can greatly influence the choices that other people make.) Order first and you will order better. The book is filled with simple strategies that people can employ to eat well, move better and sleep more. Rath’s approach is to keep the strategies incredibly simple. If the steps are so easy that you can’t possibly fail, you are more likely to stick with them. After 30 days, while other people’s New Years resolutions are already becoming a distant memory, you will have forged new habits that you don’t even have to think about. One question to ask yourself is how you will think about your New Years resolutions one year from now. Will you think back to this January and remember the big goals you had set for yourself that were forgotten by February? Or will you remember some tiny choices that you started to make differently? Looking back a year from now, will you find that those small choices have changed everything? Great to see you highlighting Tom Rath’s new book. He serves us with tons of practical and easy to digest health tips. His self-disclosure re: his life-long research to prolong his own life is an amazing story in and of itself. He has saved his own life by walking the talk and no doubt added years to his life. After being given a more or less hopeless diagnosis, how incredible. What a man. I have had the pleasure to know Tom from my syndicated radio show days. Stoic Tom, I had no idea whatsoever he was fighting a debilitating illness.His book, “Vital Friends” rocked the corporate world. It is wonderful to see him sharing his years of wisdom with all of us in his latest bestselling gem. Thanks so very much, Jeremy. Your focus on small choices was a bit hit with me! What I enjoy the most about this book is that, as you so astutely say here, each one of us can make small, even tiny choices and give our health a boost. I ended making New Years resolutions because every person can make promises that they can recognize merely will not come about. or simply to be able to outlandish to reach.